OSPREY BAY VILLA! 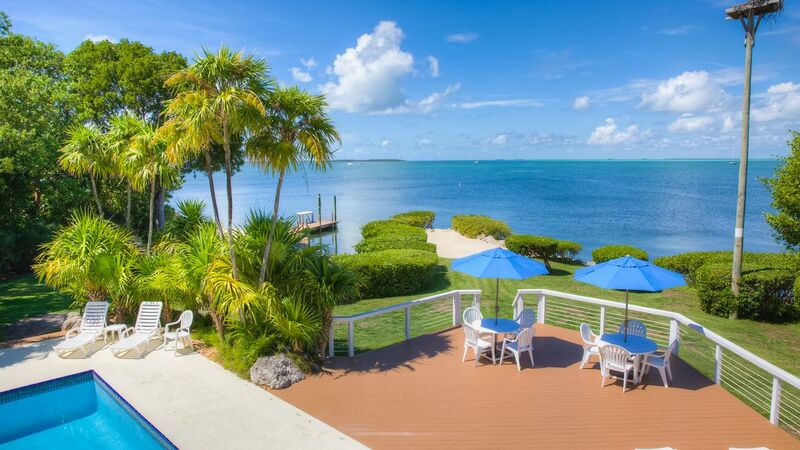 Wonderful Bay front Home in the heart of Islamorada in the fabulous Florida Keys for rent by the week, or month; offering incredible panoramic bay and sunset views. Heated pool & hot tub, sunning decks galore. Deep water dock & boat basin. Elegant, yet casual, spacious living room with coral rock fireplace, wet bar, open dining room, atrium garden,& gourmet kitchen. Sleeps 10-12 people comfortably. Private south wing offers 3 bedrooms; 1 with1 king bed, 1 with 1 queen bed, another 1 with 2 queen beds, and 1 full bathroom with bathtub & shower, double vanity sinks etc. Separate bedroom with two twin beds, tv, a/c, etc. adjacent to kitchen. Huge second level master bedroom suite with king bed & it's own master bath & vanity room, fireplace & bay side veranda. Third full bathroom with vanity and shower downstairs has an entrance from the wet bar/living room area & also exits to and from the heated pool. Lush tropical landscape & expansive waterfront lawn & dock area with its own small beach for wading into bay, for snorkeling or for an easy launch for kayaks and paddleboards. This vacation home is secluded, yet situated in a perfect location for walking to classic restaurants & local shops. Bayfront - spacious property located directly on the Florida Bay with private Dock and Boat Basin. Dining table seats 8-10. Additional seating at wet bar counter or tv trays. Also, there is a card table for additional use. There is a entertainment center in the Living room area with a 42' flat screen TV with cable. Also a VCR, DVD, CD, Tuner ,ipod plug, etc. Each bedroom has its own flat screen TV with a remote control. Available at Founders Park Islamorada, FL mile marker(MM)87. Bay front, Boat Basin & Deep Water Dockage, Heated Pool,& Spa, Lush, Tropical, Landscape Abundant Sun Decks. Just as pictured. Rooms & comfortable. Hosts were great to work with. Pool & deck area most enjoyable. Very private. Fishing action at dock was great, snorkeling too. Fantastic sunset views. Judy & Ken were wonderful to work with. Very well supplied with complimentary starter paper products, bath soaps, plenty of bath & pool towels. Variety of birds & held true to its name as we saw osprey in the nest. Close to grocery, shopping, restaurants & bait shop. Beds were comfortable & rooms clean. Would have loved to stay longer & hope to return again. Thoroughly enjoyed the home with the wonderful pool, dock, flora and fauna. The sunsets were stunning. Hope to return again. What a wonderful setting for our entire family! We needed nothing more.it included everything. A beautiful setting with wonderful access to the bay. We rented a boat and enjoyed the fishing almost every day and the sunsets every night. .Very comfortable for the entire family with easy access shops and restaurants. Thank you Judy and Ken in making our stay so comfortable. How nice to hear from you Steve! We are thrilled that Osprey Bay Villa and property met all of your expectations and then some. We love happy guests, and that's what it's all about! Osprey Bay Villa is all that it looks like in the photos and more! This extremely welcoming Villa is fully self service! Everything is clearly labeled even down to the light switches! The pool and hot tub are sparkling clean and the deck and private beach is perfect for watching sunsets! We caught mangrove snapper off the dock every night! And there is a great Publix grocery with everything you need 1 minute away. Judy is the perfect hostess, begin responsive whenever we needed her and yet allowing us all the room we needed and privacy! We were a family of 7 adults and a 2 1/2 year old child, and there was plenty of room for all of us! We would go back in a heartbeat! House, pool, and hot tub were perfect for our extended family vacation! Everyone could gather together or have time away if they needed a break! The pool was the favorite part of the trip for the kids! Thank you Janna and Family! So thrilled you could spend Christmas and celebrate your parents 50th wedding anniversary at Osprey Bay Villa! Always love when our "Islamorada Island" ambiance shines through our property for all of our wonderful, caring guests. Yes, the pool, hot tub, lounging decks and "the View" --"Plays well with Others!" Hope you and your family and friends will come visit us again. Lovely home with love and warmth of family and friends. Not to mention the Spectacular Sunsets! Thank you for the caring. Theater of the Sea; a great marine attraction! Swim with the Dolphins, etc. Feed the giant Tarpon at Robbie's Marina. Snorkel or scuba dive many reefs nearby or Pennekamp Park or right here along the shoreline of the bay. Endless fishing -Ocean or Bay or right off of Osprey Bay's dock. There are fabulous restaurants all with in a mile of Osprey Bay. Rates are subject to change until confirmation of reservation. * Please Note: Monthly rentals are $20,000.00 and require 2 cleaning fees at $300.00 each: 2 weeks after check-in and at check-out. The refundable Security Deposit for monthly rentals is $2,500. Total of Rental payments and fees including Security Deposit is due 90 days before arrival. After 90 days these fees are non-refundable unless the nights that were reserved can be re-rented.